Thatcham Research, the UK’s only NCAP accredited research centre, has urged car manufacturers to fit automatic braking as standard after if emerged that just two per cent of car buyers are taking-up the tech as a paid-for option. A recent report by Euro NCAP has found that autonomous braking systems were responsible for a 38 per cent reduction in real-world rear-end crashes in Europe. However, while the benefits are becoming established, just 17 per cent of UK cars feature the technology as standard. Matthew Avery, director of insurance research, at Thatcham said: "Typically, most car buyers are not interested directly in safety systems. Most believe all cars to be safe and several surveys have said car buyers not prepared to pay extra for safety. Also, many dealers don't understand what the systems do and often don’t have the ability to demonstrate them. "We would like to see less optional and more standard, as we know optional take-up is only around two per cent. So while the cars are capable of having an AEB system, the manufacturer decides not to make it standard." Insurance data from black box recorders suggests that three quarters of collisions occur at speeds less than 20mph in the UK. 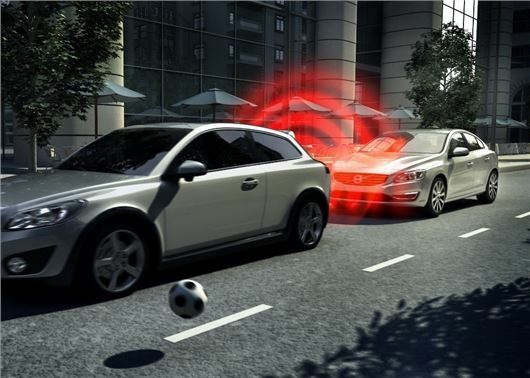 As a result automatic braking could have a dramatic impact on cutting accidents and lowering insurance premiums. However, with so few cars featuring the tech as standard, buyers are being asked to pay between £180 - £1300 to have it optionally fitted.